Can French Troops Protect 'Sensitive Sites' from Next Terror Attack? Originally published under the title, "3 French Soldiers, 3 Sitting Ducks." 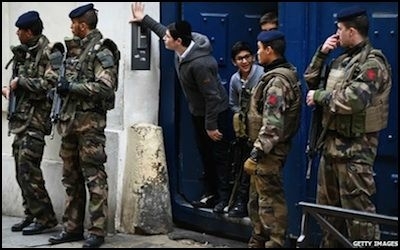 Shortly after the Paris terror attacks last month, the French authorities deployed thousands of troops to protect Jewish schools and other "sensitive sites." Another Islamist immigrant from Mali named Coulibaly has attacked another Jewish institution in France. The first one, Amedy Coulibaly, murdered four Jews at a kosher store in Paris on Jan. 9; this second one injured three soldiers yesterday as they protected a Jewish community center in Nice. Police say Moussa Coulibaly, about 30 years old, with a record of theft and violence, and apparently not related to Amedy, pulled a knife about 8 inches long out of a bag, injuring one soldier in the chin, one in the cheek, and one in the forearm. They are soldiers, not police, and so not trained to be alert to street problems. The ostensible protection the soldiers offer actually provokes Islamists and other antisemites. They tend to get distracted by their smartphones or pretty girls passing by. They clutch their assault rifles across their bodies, which leaves them vulnerable to someone driving by and shooting at them. As confirmed by today's attack, the ostensible protection they offer actually provokes Islamists and other antisemites. They are only posted temporarily to the Jewish institutions in the aftermath of the Hyper Cacher attack a month ago and before long will leave. They protect only the institutions themselves, not the people who come and go to them, who remain as vulnerable as ever. The troop deployment does little to protect the Jewish community or solve the larger problem of Islamist violence. In short, the soldiers are sitting ducks whose deployment does little to protect the Jewish community or solve the larger problem of Islamist violence. But it does offer another instance of emotionally satisfying "security theater" which temporarily gives everyone a constructive sense of doing something. A real solution will require much deeper and longer-range steps that concern national identity, immigration policy, integration efforts, and effective policing. A former French navy officer informs me that "If you asked a general why the soldiers did not shoot the attacker, he would dodge the question as he cannot lie but they could not shoot because the guns you see strapped on these soldiers has an empty magazine. It has no bullets! It's insane! Certain officers have a loaded magazine separately in a pouch, but not inserted in the gun. The only military personnel allowed to carry loaded weapons are the gendarmerie. All others, including soldiers, infantry, and even commandos are not allowed to carry loaded weapons. Because this is ridiculous, the government hides it." One reader wonders, even if the soldiers are armed, how prepared they are to shoot: Is the assault rifle round chambered or do they need to chamber a round first? Is the weapon on safe, requiring them to take the weapon off safe before they fire? Is the rifle set on auto fire or on semi-auto? William Mayer of PipeLineNews.com asks "why these soldiers apparently had little or no expertise in open hand combat. Disarming an opponent carrying a knife is rudimentary and taught (in the US) in boot camp. Even without weapons, three soldiers should have been able to handle a street thug armed with just a butcher knife." He noted on his website yesterday that "If the best and brightest of the country's anti-terror forces are incapable of stopping a simple assault by a man with a knife, there is little to prevent further attacks by Islamic fanatics. As a matter of fact the message of weakness being sent is one of provocation not steadfastness." A sports club reported him to the police after he showed signs of "aggressive proselytizing." This included behaving coldly toward women and reproaching a man for showering naked. But the police did not put him under surveillance. He bought a one-way ticket to Turkey in early January. This, his behavior, and issues with his passport prompted an employee to notify Air France, which called the police. Nonetheless he was allowed to go to Turkey. French intelligence services asked the Turkish authorities to deport him immediately back to France, where on Jan. 28 he was questioned by counterterrorism officers, then released just days before the attack. Related Topics: Immigration, Muslims in Europe, Terrorism, War on terror | Daniel Pipes receive the latest by email: subscribe to the free mef mailing list This text may be reposted or forwarded so long as it is presented as an integral whole with complete and accurate information provided about its author, date, place of publication, and original URL.